Here north of Boston, we have been having crazy weather, wild swings from cool and rainy to suddenly warm and sunny, sometimes in the same day! This makes for mist, fog, and haze. Yesterday there was a break from the rain in the afternoon, so we took the dog for a walk at Independence Park here in Beverly, MA. 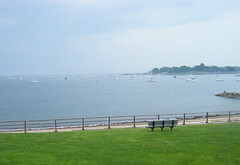 This is a great little park on the ocean with a view all the way to Salem Willows Park (in the distance). Last year we came here to watch fireworks (set off a Salem Willows and Marblehead and Lynch Park). But even on an ordinary afternoon, the view is spectacular. Yesterday we couldn't go down to the beach because of the dog, but even from the sidewalk, the view of the ocean was great. The hazy weather made for interesting light, so I took a few pictures. Tonight I cropped this one to get this composition. I took my sketchbook along to Starbucks yesterday and started this little drawing. I couldn't find my Sharpie, so I started the sketch with a plain black pen even though it doesn't show up as well, especially with this sketchbook which has light brown paper. But once I got going, it didn't matter. 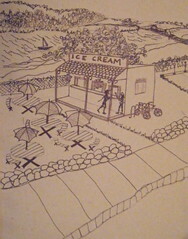 I decided to draw a Massachusetts ice cream stand, working from imagination and memory. And I have plenty of memories because I have made lots of visits to the wonderful Mom and Pop ice cream stands that make Massachusetts famous for its ice cream. Well, yesterday's Starbucks break was over before I had finished the drawing, so tonight I decided to work on it some more. This time, I had my Sharpie, so I used it to go over some lines. I had already drawn in a couple of bicycles, so I thought I had better include the bike riders! 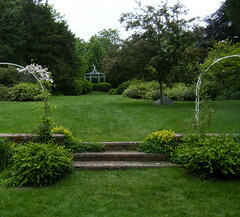 I took this photograph during a recent walk at Long Hill Gardens here in Beverly, Massachusetts. I love the little pink and white flowers because they look as if they have been painted. 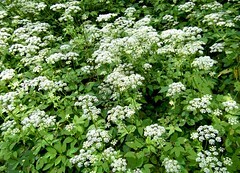 I don't know what kind of flowers these are; sometimes the shrubs are labeled at Long Hill, but I forgot to look! This is a collage and decoupage project in progress, a heart-shaped box that I am covering with designs created from printed metallic ribbon. I went to the studio this morning to work on this for a while. It was in the 80's here yesterday, and so I was expecting it to be very warm in the studio, and it was. One advantage of the warm weather is that the glue (acrylic medium) seems stickier, and that makes the work a little easier. However, about an hour is all I am good for when the studio is so hot. I concentrated on filling the remaining gaps in the gold area around the perimeter of the box, and also placed some red pieces in the interior as I came across them. Filling gaps is a bit tedious, especially because I am already thinking about what designs and colors to use for the remaining surfaces. 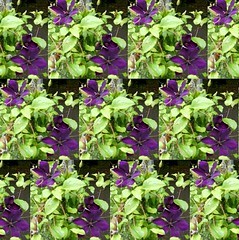 A couple of days ago, I published my photograph of clematis, posterized in Painter. 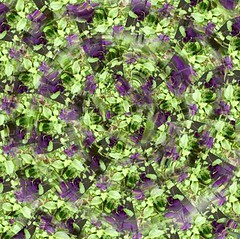 Yesterday, I used that photo to create a pattern. Tonight I decided to see how the pattern looked when I used it with Painter's pattern pen. I just started making circular movements, and then decided to make a spiral. (That's harder than it sounds when you are drawing with a mouse. It took several attempts!) Then I decided to fill in the negative space with a second spiral, and that created a kind of natural mandala (circles within circles). This seemed like an appropriate image for a day in which I sometimes felt like I was running in circles. Seen from the right perspective, the circles become a mandala, and the day becomes, actually, quite beautiful. Tonight I used my Painter program to create a digital pattern. I used the posterized photo of clematis that I posted here yesterday. I thought it might make a good pattern because of the darker area on the right side of the image. 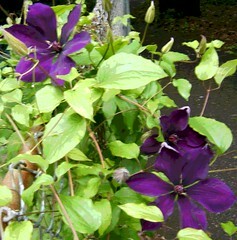 I knew it was about time for the clematis to open. 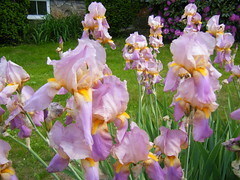 They usually bloom around the third week in June, but the weather has been cool and rainy. 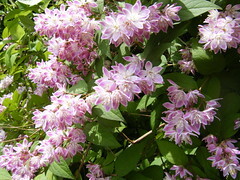 But the clematis bloomed right on time, apparently determined to have their annual June celebration despite the weather. I took some pictures yesterday while I was on my way to run an errand. Tonight I cropped the photo to get this composition, and then posterized it with my Painter software. Sunday's excursion into Cambridge took place on a rainy day. But it was a good day for coffee and bookstores, and fun to see all the new students, who were enrolling for summer session I assume. I didn't think it would be a good day for taking pictures, but I did see a good photo op while I was exploring the fiction section at the Harvard Coop (Cooperative Bookstore). 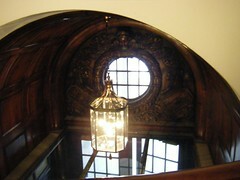 The fiction section is on the second floor, and runs around a kind of balcony with an open view of the floor below. It's a great space, and it is fun to walk around the balcony, so I did. When I got to the front of the store, I looked down on the entryway, where I saw this view. I like the carving, and I also liked the geometry, all those circles and rectangles, so I took a picture. I have spent a great deal of time on college campuses, which may be why the fliers taped to the door were invisible to me when I took the picture. I only noticed them when I saw the photo on my computer screen. So I opened the image in Painter and used digital pastel to remove the pieces of paper from the door. While I was at it, I also removed a glimpse of a passerby's shoe, visible through the doorway in the original photo. (Cambridge was crowded on Sunday, but not crowded!) So now here's a clear and unobstructed view of a Harvard classic! During a recent walk at Long Hill Gardens, we saw these amazing two-color roses blooming right next to the house. I don't think I have ever seen roses in two colors growing on the same bush! Of course, I took some pictures, shooting the flowers from below because they were leaning over somewhat. As I took the photograph, I could already see that the leaves looked like they had been eaten alive. 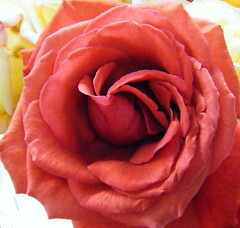 In fact, some of the rose petals looked like they were past their prime. For a second, I wondered if it was worth it to take the picture. But nothing in life is perfect, and I think that if you see a bi-color rose bush, you can't pass it up! Tonight I decided to see what I could do to rescue my photo. I cropped this composition out of the original photo, and opened the image in Painter. I drew into the photograph with the digital pastel, covering up the holes in the leaves. Then I did a little clean-up of a few of the rose petals. I posterized the image, but was losing detail in the brightest yellow flowers. So I added just a bit of color overlay on the inside of the flower, and tried posterizing again. This time I was happy with the result, even though this image is not perfect. But then, nothing in life is perfect, not even art. In fact, insisting on perfect can often mean missing out. 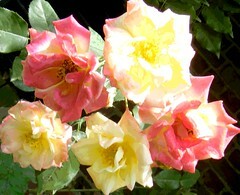 I am glad I didn't miss out on these pink and yellow roses! This image is a piece of digital art based on a rescued snapshot. The original snapshot was crooked, so I started by straightening and cropping the image. Then I opened it in Painter, and posterized it. I also used color overlays and the "magic wand" tool to colorize the image. I found this image among some family photos. The fisherman standing up in the boat is my dad as a young man. I don't know where or when the photo was taken. But based on other photos, I am guessing it is around the time he was in the army, either shortly before he left to go overseas, or soon after he returned. At the time this was taken, he probably wasn't my father yet, although he soon would be. But this photo brings back memories of going fishing with my dad and my uncle at Lake Isabel, back home in Colorado. Once in a while, my cousin and I got to tag along. I was always too squirmy a kid to be interested in the actual fishing part of the trip, but I remember that I certainly was interested in the worms and minnows. 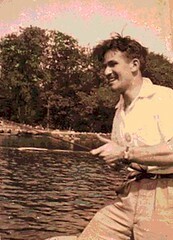 My cousin and I each had little fishing poles, and I remember that my dad and uncle were trying to teach us to cast. Well, I don't believe I ever caught a thing. But even after all these years, I still remember the excitement of going on an adventure with my dad. That's why I thought this would be a nice image for Father's Day, so here it is. Today, walking towards the gardens at Long Hill, I noticed some Queen Anne's lace growing beside the path, so I took some pictures. Tonight I cropped this image out of the original photograph. Then I opened the image in Painter, cleaned up some distracting debris with a little bit of digital pastel, and then posterized it. On a recent walk to Beverly Common, I saw that the rose bushes were in bloom, so I took some pictures. 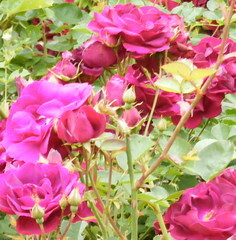 There were lots and lots of roses in the park, and there were also lots and lots of roses in the original photograph. Tonight I cropped the best photo to get this image. I was trying to focus on a few of the roses, and still convey the sense of an abundance of roses. It isn't always easy to capture an experience in a photograph. Sometimes showing a detail works better than trying to give an overview. That seems to be true in this case. I went to the studio early this morning and fit in an hour working on this project. 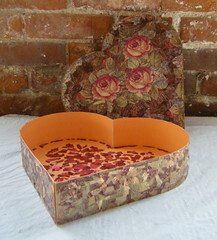 I am covering this heart-shaped box with decoupage and collage patterns created from printed metallic ribbon. I focussed on filling in gaps around the outside of the box, but also added some pieces of red ribbon to the interior. It was an overcast day, so I didn't think the box would photograph very well. But when I put the box top at just the right angle, it caught the light. One of today's errands was a long schlep to a vet's office (booster shot for the dog). As we were about to leave, I noticed a little bouquet of cut roses on the counter, right at eye-level. This was a nice surprise, so I took a few pictures. Tonight I cropped this image from the photo with the truest color, working to get a square format. Seeing the roses was a bonus, and so is this photo. As always, it pays to stop and photograph the roses! 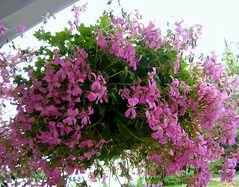 Today I used Painter to enhance the photograph that I posted here yesterday, a hanging basket of pink flowers. (I took the picture while waiting for my hot fudge sundae at the Cherry Hill Creamery in Danvers, MA.) I posterized the photo and then used a transparent color overlay to add a pale blue to the sky. I took this photograph today while waiting to pick up my order at the Cherry Hill Creamery in Danvers, MA. (Isn't that a great name for an ice cream stand?) The weather has been rainy, but this afternoon, the sun seemed to be coming out. So I suggested an ice cream run to my daughter. By the time we got to the ice cream stand, the weather had turned cool again. So we had hot fudge sundaes! During a recent walk at Long Hill Gardens, I decided to take a picture of the lawn behind the house. I think it is used for weddings (though I have never been to a wedding at Long Hill). I usually don't photograph this area because it is relatively plain, compared to the rest of Long Hill, which is fill with amazing flowers at every turn. But the back lawn is wonderful, and a very pleasant space to walk through. Tonight I cropped the original photo to emphasize the symmetry of the space. I took my sketchbook along today when I took a break at Starbucks. I started another drawing, working from my imagination. I was thinking about last weekend's adventures with my cousins. Ideas for a lunch destination included the Clam Box or Farnhams or Woodmans (which is where we ended up). This little drawing is inspired by all three. The building itself reminds me of Farnhams (although I haven't seen it in quite some time and may not be remembering correctly). My little building does not look like the Clam Box (which is actually built in the shape of a box used to serve clams). But the stripes on the awning remind me of the red and white Clam Box awning, and the roadside location is similar. The background is a rendition of the view from behind Woodman's (see my post of June 6). I had fun working on this drawing. I think it is still a work in progress, but this is how it looks as of today. I took this photo during a recent walk at Long Hill Gardens. There are lots of flowers blooming now, so I took a lot of pictures. I really liked the way these iris looked against the fence. If you look closely at the fence, you can see a design (possibly Chinese) in green porcelain. Well, I did notice that, but I wasn't looking closely enough at everything else. I overlooked the fact that some bright yellow flower petals had fallen on the fence. Tonight they were getting in my way when I was trying to crop this photo, so I opened the image in Painter and used a little digital chalk to clear it out of the way. Then I posterized the image and cropped it again, and here it is. Yesterday I posted a photo of this project as it looked on June 9th. 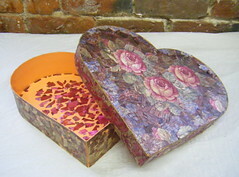 This is a heart-shaped box that I am covering with collage and decoupage created from printed metallic ribbons. Since I have been working on the interior of the box, I decided to take a photo of that too. I am posting it here tonight, even though it isn't really ready for prime time. Yesterday I went to the studio for an hour to work on this collage and decoupage project. 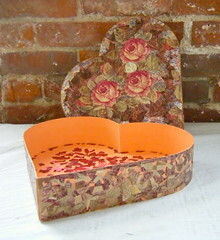 I am using pieces of printed metallic ribbon to cover this heart-shaped box. I have been working on the outside of the box, which is gold. I am now basically filling in gaps to finish that part, and also working on the red interior at the same time. I am already thinking about what patterns and colors to use on the remaining surfaces. I took this photograph yesterday. These beautiful roses were blooming near the house at Long Hill Gardens, and I saw them suddenly as we approached the house that stands in the middle of the garden. 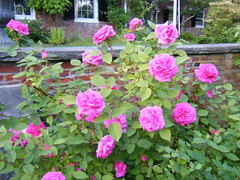 Roses are a treat at Long Hill in June, and especially nice for the lucky people who have June weddings on the property. I liked the pink roses against the spring green leaves. (This has always been one of my favorite color combinations and in fact, I asked my bridesmaids to wear pink and green dresses at my wedding, a choice that some of them no doubt did not appreciate!) I thought the roses looked great against the backdrop of the old mansion, so I took this picture. Tonight I edited it in iPhoto, straightening, cropping, and doing a little repair work on some leaves that had been chewed on by insects with great taste in flowers. On Sunday, my daughter and I decided to explore Beverly's community garden. It's tucked away on a side road, hidden behind some hedges, but still so close by that it is surprising that I had never seen it before. It is a wonderful place, with lots of individual plots. Most of the people grow vegetables, and donate surplus to Beverly Bootstraps. It's fun to see the various ways people set up their gardens. There were a few plots that are growing flowers, and this one was spectacular, so I took some pictures. Yesterday I went to Boston with my cousins to see the Institute for Contemporary Art. We saw the Shephard Fairey exhibit (which is really interesting), as well as some of the other shows and videos. The ICA brings in really strong exhibits, but the building itself is a work of art. 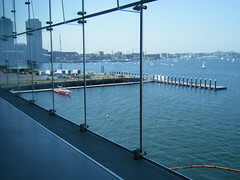 It is set right on the ocean, on the Boston waterfront, and really uses the setting as part of the architecture. As you walk in, around, and through the building, you suddenly come across views of the ocean, always dramatically framed by the architecture. For example, yesterday I came out of a darkened exhibit space right into this bright corridor and saw this view of the ocean. I was interested in the way the geometry of the windows was at play with the perspective of the view, so I took some pictures. This one was the best of them. Tonight I cropped it to get this composition. My cousins were visiting today (from New York and New Hampshire), and we began the day's adventures with lunch at Woodman's in Essex, MA. 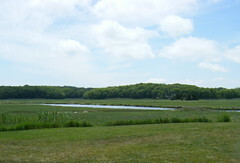 After lunch, I took some quick pictures of the salt marsh behind the restaurant. Tonight I chose the best version, and cropped it to get this composition. 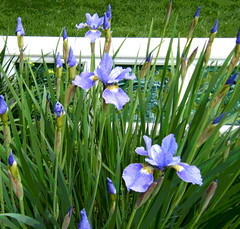 While I was taking a walk yesterday, I suddenly saw these tall iris, growing at the edge of the sidewalk, behind a low stone wall. They weren't literally at eye-level, but they were tall! 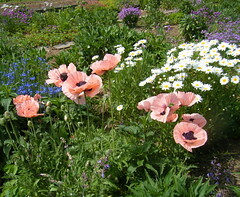 The flowers were so beautiful and the view of them was so great that I quickly took a picture with my digital camera. In doing so, I captured part of the yard as well as a bit of building (garage perhaps) in the background. My original intent was to crop all that out and focus on the flowers. And I tried. But in the end, I decided that in this case, the background adds to the composition. And more important, it helps convey the moment of surprise as I suddenly came across these flowers. Yesterday's noon-time walk took place along the walkway at the beach in Lynn, MA. (We stayed on the sidewalk because dogs aren't allowed on the beach this time of year.) We had lunch on the go from a take-out stand. 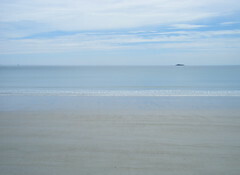 I liked the combination of clouds, ocean, and sand, so I took this picture. Tonight I did a bit of straightening and cropping, but apart from that, this photo is just as it came out of the camera. Yesterday, I had to drop off my car to get the brakes fixed, and knew I was going to spend an hour or two waiting for it, hanging around at a nearby Starbucks. So I decided to take a sketchbook along. (I grabbed a new one, with recycled paper, pale brown, and also took along a Sharpie pen. ) After I had some coffee (and another piece of Luscious Lemon Tart), I started drawing. 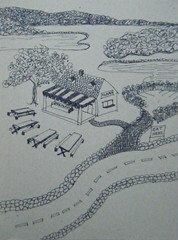 I wanted to do another exercise with texture, so I decided to draw a Massachusetts farm stand. 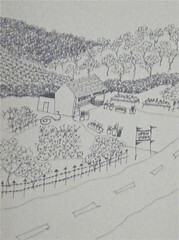 I was drawing out of my imagination, but also from memories of the many farm stands around here. I had a great time, fully occupied for about an hour and a half. I didn't mind waiting, even though it took a bit longer than expected. I noticed that once I finished the drawing, I suddenly became much more aware of the time (and found myself impatient to get on with my day). But I had so much fun drawing, I liked the little pen and ink sketch, and in fact, the time spent waiting for my car repair was a gift. Yesterday afternoon, I had an errand at Red Brick, and decided to stay and spend an hour in the studio, working on this project. 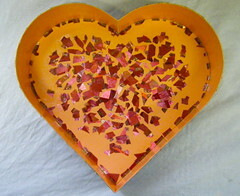 (This heart-shaped box once was the container for a Mother's Day present from my daughter.) 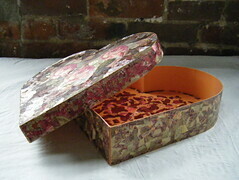 I am covering this box with decoupage and collage patterns created from printed metallic ribbons. Yesterday I continued the (apparently everlasting) task of pasting pieces of gold ribbon around the perimeter of the box. I am really seeing progress now, and am really just filling in remaining gaps. As I went along, I also added some red pieces to the interior, which still has a way to go. Life has been hectic, so it might seem counter-productive to go to the studio to make art. But that is when I need it most. I am not just working on a heart-shaped box. I am working on myself. After an hour, I head back into my busy schedule, but with a more peaceful feeling in my heart. 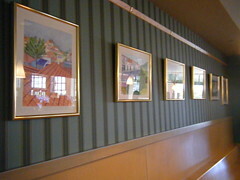 Today I spent the morning hanging some of my paintings in the cafe at the local Barnes & Noble (North Shore Mall in Peabody, MA). Even though this is a small show (just six paintings), it was a bit of a workout, with lots of schlepping, as well as climbing up and down. It was also a mental workout as I tried to make sure the paintings were evenly spaced. (It is a bit of a challenge to do this when you are hanging paintings from S hooks with fishing line. You have figure out how much fishing line to cut, and have to use approximately the same amount of to tie knots on each piece, etc. ) Added to this was the time pressure of trying to hang the show after the morning coffee crowd but before the lunch crowd. So I was feeling pretty stressed. But things came together at the end, and all of a sudden, as soon as I had all the paintings up on the wall, I was happy with the way they looked and very excited about the show. It opens today, and will be up through June and July.